If you know your Probe thread size, click on M2 or M3 threads to see an assortment of Common CMM Styli available. Thread Adaptors are available to use any styli with any probe.To determine your thread size measure the diameter of your current Styli thread or check your probe model number. STYLI WITH M2 THREADS WILL FIT RENISHAW PROBES MODEL NUMBERS: TP2 5W, TP2 6W, TP20, TP200, FOWLER and some TESA Touch Probes. STYLI WITH M3 THREADS WILL FIT RENISHAW PROBE MODEL NUMBERS: TP1, TP1s, TPES, MIP, TP6, TP6A, and some TESA Touch Probes. 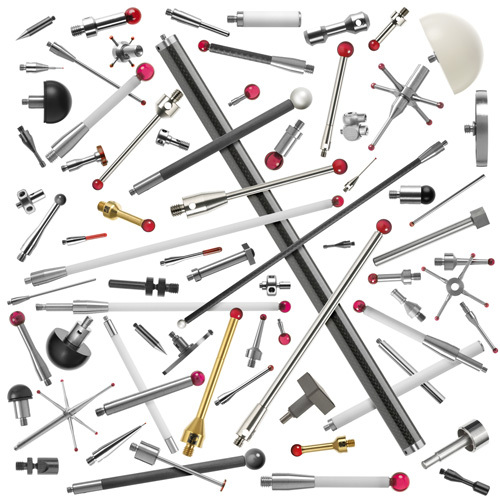 M4 and M5 styli are also available for Machine Tool Probes and Zeiss Probes. Please call with manufacturer’s part number or description.